Mark Levinson No.326S/532H review | What Hi-Fi? 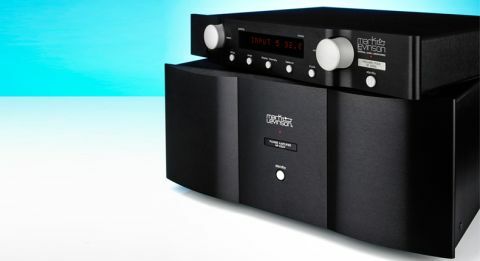 Mark Levinson can quite rightly claim to be one of a handful of brands that originated what we now call the ‘high-end’. Alongside the likes of Krell and Audio Research, it helped establish the segment’s recognised template, which includes over-engineered electronics, lavish construction and of course, enormous price tags. This Mark Levinson 326S/532H pre/power pairing may be one of the company’s more affordable offerings, but in most cases we suspect it’ll be the only amplifier anyone ever needs. We certainly can’t think of a system where this combination becomes an obvious weak link. We can’t help but admire the 326S preamplifier. By high-end standards it’s a compact unit, yet there’s also an undeniable aura of class about it. That impression starts with the superbly made casework, which combines precision build with a well-damped solidity few rivals can match. We also like the feel of the front panel controls: the input selector has a lovely, positive action while the volume control just glides as it turns. Mark Levinson’s statement preamps are usually two box designs that keep the signal and power supply circuits physically separated to minimise any interference. Here it’s all in one case, but the engineers have worked hard to minimise any sonic degradation by covering the entire power supply section in a steel case to shield the audio circuitry from any unwanted electrical effects. Remove this shield and you’ll find a sophisticated power supply arrangement. There are two mains transformers – one for the signal path and the other for the control circuits – in a bid to avoid any sonic degradation caused by interference. The mains is heavily filtered too, and any noise suppressed with the view to providing the audio circuits with the purest power feed possible. The preamp’s internal electrical layout is dual-mono, where the left and right channel circuits are as symmetrical as possible to optimise stereo imaging. Take a look at the rear panel and you’ll see this internal layout echoed in the way the left and right connections are positioned on opposite sides. Connectivity is good with no less than seven line-level inputs in a mix of single-ended and balanced XLRs. If you have a record player there’s also the option of a built-in MM/MC phono module for an extra £1375. The 326S can be configured easily, with input names customisable and everything else adjustable, from display brightness and gain for each source. The 300W-per-channel 532H power amplifier is a far simpler thing as such units usually are. This is a sizable powerhouse, measuring 19 x 45 x 50 cm and, at 34kg, heavy too. It also runs a little warm – not so much that it’ll fry eggs but enough to gently heat our test room after a few hours of heavy use. Make sure you leave plenty of space around it to help heat dissipation. Take a look inside and you’ll find it too has a dual-mono configuration right down to using twin (rather hefty) mains transformers – one for each channel. There’s also rather a lot of empty space inside (see photo above). This is because the 532H is part of a power amplifier range where the mono, stereo and five-channel versions are all built using the same casework. You can connect to the 532H via single-ended or balanced XLR options. A small rear panel toggle switch allows easy swapping between the two choices. There’s also an ethernet connection, but before you get too excited there isn’t a streaming module built into this power amplifier. The ethernet port is there to enable the amp to be configured as part of a multiroom set-up when using ML’s No.532 Media Console. The 326S/532H combination is nice to use. That’s not always the case with high-end equipment, which tends to compromise usability either in the pursuit of better sound or (just as often) an impressive appearance. This Levinson pairing avoids both issues. It has an intuitive control layout and is responsive in use. The 326S also has a one of the clearest displays around – it’s easy to read from the other side of our test room – and a nice remote too. That remote is a small, chunky unit that’s comfortable to hold and simple to use. Remotes are the main point of contact most people have with their kit, so we’re always surprised with how few high-end manufacturers make a decent effort here. Well done to Mark Levinson for doing so. This is a pairing that sounds promising, even straight from cold. Given a few days of running the sound gains in transparency and refinement, while continuing to deliver plenty in the way of scale and authority. While the duo is undeniably talented, we initially wondered whether its presentation is just a little too subtle for its own good. There’s never any shortage of volume or power – how could there be with such a muscular power amplifier? – but questions remained over what we saw as a shortfall of punch and attack. Over time these doubts fade, as we realise this impression is a result of the 326S/532H combo’s class-leading refinement and composure. There just aren’t any hard or bright edges in the sound so there’s never any artificially emphasised excitement. Play a challenging piece of music such as Hans Zimmer’s The Battle (from Gladiator OST) and this pairing takes it all in its stride. We’re greeted by a full dose of fire and fury; crescendos crash with impressive force while there’s plenty of drive to the rhythmic elements of the track. This music is enthralling and quite fearsome when replayed at the huge volume levels this amplifier is capable. There is a massive sense of scale here and class-leading authority to the rich and insightful low-end. While enjoying the thrills on offer, we also become aware of just how composed the presentation is. Even with the music at its most challenging, this ML pairing sounds totally unflustered, almost like it barely has to try to produce all that fury. There’s no undue hardness in presentation during dynamic peaks, and no softening of extremes either. The pairing’s sonic stability is breathtaking, with subtle instrumental strands remaining easy to follow no matter how demanding the music gets. The stereo imaging is impressive too, with a presentation that is wide, deep and very well layered. Instruments are locked in position, refusing to budge even when a crescendo hits. It would be a real surprise if qualities such as resolution and transparency weren’t straight out of the top drawer, and they are. While this amplifier is happy for you to concentrate on the big picture, it’s equally content if what you crave is analysis. Low-level details are all there just waiting to be heard. You can hear the subtle clues that define the recording acoustic when listening to Beethoven’s haunting Moonlight Sonata or revel in the lovely electronic texture of the bassline in SBTRKT’s Wildfire. The midrange is surprisingly fluid in the way it communicates nuances, and there’s an appealingly natural way with which this amplifier renders vocal-based music. Rhythmically, this pairing does a good job, communicating the changing pace and momentum of the track. The delivery is agile for one so powerful, and it traces the leading and trailing edges of notes nicely. Tonally we don’t think these Levinsons are strictly neutral. They sound just a little rounded at the top end and a touch rich through the midrange for that. But, these characteristics are mild and give this combination a more forgiving outlook as far as handling aggressive recordings are concerned. The 326S/532H combination is certainly revealing enough to show-off any shortcomings in the production (or partnering equipment for that matter) but they never overemphasise things, and that’s good if your collection is based around music you like (as ours is) rather than audiophile recordings. It’s a massively capable pairing that delivers a refined, controlled yet hugely entertaining sound. Add terrific build and the lure of the legendary Mark Levinson brand name, and it’s easy to be tempted.